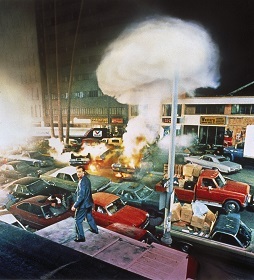 4 stars for this disturbing apocalyptic eighties classic. 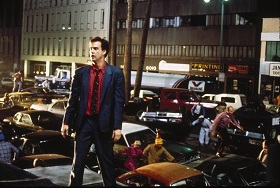 Miracle Mile is written and directed by Steve De Jarnatt (Cherry 2000, For the People). In 1983 it was described by American Film Magazine as one of the top ten unproduced screenplays and in 1988 the script was bought back by De Jarnatt and finally released as a film. Harry Washello (Anthony Edwards – E.R., Consumed) is a thirty year old, who is still waiting to find the woman of his dreams. One day, while visiting the La Brea Tar pits in the Miracle Mile area of Los Angeles, she walks into his life in the form of Julie (Mare Winningham – Philomena, Turner and Hooch). She is sweet and slightly crazy and he falls for her immediately and arranges to meet her for a date when she finishes work at the all night coffee shop at midnight. Unfortunately for Harry, the power in his hotel goes out and his alarm clock fails to go off, so when he wakes up it is almost four in the morning. He rushes over there, but obviously she is long gone. When the phone box next to him begins to ring, he picks it up, only to find it is a wrong number dialled by a man working in a missile silo, who delivers the panicked message that nuclear war has started and the missiles will hit in less than an hour. He must attempt to persuade the people at the diner that it is true and find transport to the airport to get away before the missiles hit. As word spreads and rioting begins, he must find Julie and try to get them to a helicopter pad and out of the city. Miracle Mile is a very cleverly written film. Starting out as a standard cheesy eighties romance, it quickly turns extremely tense, assisted greatly by a haunting score by Tangerine Dream. The acting is also very good, with a surprising cast including Denise Crosby (Star Trek: TNG, Deep Impact), Mykelti Williamson (Forrest Gump, Con Air) and Robert DoQui (Coffy, Nashville). The feeling of urgency that is created is astonishing, as the film unrolls before your eyes in real time and you find yourself counting down to the apocalypse. Even better, as the city descends into chaos on the weight of a single phone call made to a wrong number, it is not until the very end that you find out whether the threat is real or all just a terrible mistake. An excellent film that really makes you think and is definitely well worth adding to your collection. 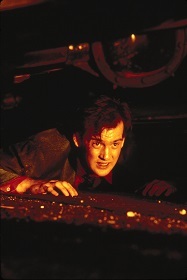 Miracle Mile is available to buy now on Dual Format DVD and Blu-ray.